Chanting is Not Just a Process; It’s a Relationship. Chanting is one of the nine processes of bhakti, but we can easily define or relate to a process as something mechanical and think that externally executing the process will guarantee specific results. When you think of chanting as a relationship, you become aware that the relationship is suffering when you don’t chant well (which is why you suffer). Since Krishna wants an intimate relationship with you, and since He wants you to come back to Him, He is also unhappy when you don’t chant well (and happy when you do chant well). We are told that Krishna has everything. Yet there is one thing He doesn’t have – our heart. And this is what He wants most. Chanting is a way to give back to Krishna what He wants most, a relationship with us. I like to see the maha-mantra as a gift of love. Krishna is offering us a relationship with Him through the chanting of His holy names. The maha-mantra is the personification of Krishna’s love for us, and the love for Himself that we develop through chanting the mantra. The maha-mantra is like the fishing line of love that Krishna extends to all of us. How fortunate we are. And how unfortunate we can be to take the holy names for granted, to mumble off our “snick, snicks, ram, rams” while our minds travel the universe. Allow yourself to feel Krishna’s affection for you while you chant. Feel how much he wants a relationship with you. 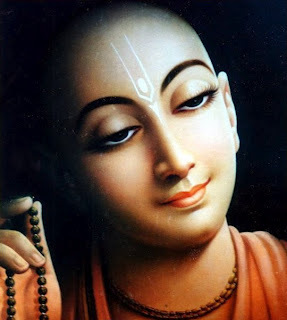 (If he didn’t care about you and me, he wouldn’t have incarnated as Caitanya Mahaprabhu, neither would he have sent Srila Prabhupada to deliver the world.) As you allow yourself to feel Krishna’s affection, appreciate your great fortune in being able to chant the holy names and reciprocate with His loving call and the loving embrace of Radha and Krishna. A process, as opposed to a relationship, is done without consciousness. A process alone doesn’t express affection; you must express affection yourself. You can offer a gift to someone in order to get their favor, but if won’t communicate affection if offered with ulterior motive. Even though you did what appears to be a kind or proper act, the act is only meant to be a medium to express your love. An act alone doesn’t necessarily express affection. Similarly, the maha-mantra is the medium through which we express our devotion, sincerity, and pure motivation to Krsna. Chanting alone is not necessarily an expression of devotion. For example, what is the difference between an ordinary person’s cooking and Mother Yasoda’s cooking. They both cut vegetables, use a pot, and cook on fire. The difference is the consciousness. Similarly, what is the difference between two people who externally perfectly execute the process of chanting (sitting straight, pronouncing properly, eyes focused, etc.). The difference is in the consciousness. Two people are chanting what appears to be the same mantra, but may in actuality be chanting two different mantras. One may be chanting for material benefits or liberation, while the other is chanting for pure devotional service. Pure devotional service is defined as service done without motivation for material gain or liberation. Similarly, pure chanting is chanting done with the motivation only to please Krishna. Can we chant purely if we are not pure? Yes. Just chant with the motivation to become a pure devotee and to please Krishna with your chanting. Write down the realizations you get this week by chanting in the mood of chanting is a relationship. And let me know what realizations this gives you in the below comments section.